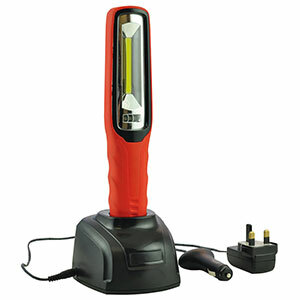 Let this versatile product light up your working day with its useful 2 in 1 functionality. Use the strong COB LED floodlight for larger projects and switch to the powerful spotlight for precision tasks. The ergonomically designed shock-resistant rubberised housing features a comfortable grip, finished with strong polycarbonate lens. This work light is rated as IP65 which means that it is both oil and water splash resistant. The lithium-ion rechargeable battery is high capacity which provides an output of around 300 lumen. Complete with a 360 degree rotating top hook, this lamp can be located wherever you may be working. Comes with a desk / wall mountable charger with an in-built transformer and a 12v in car charging lead.